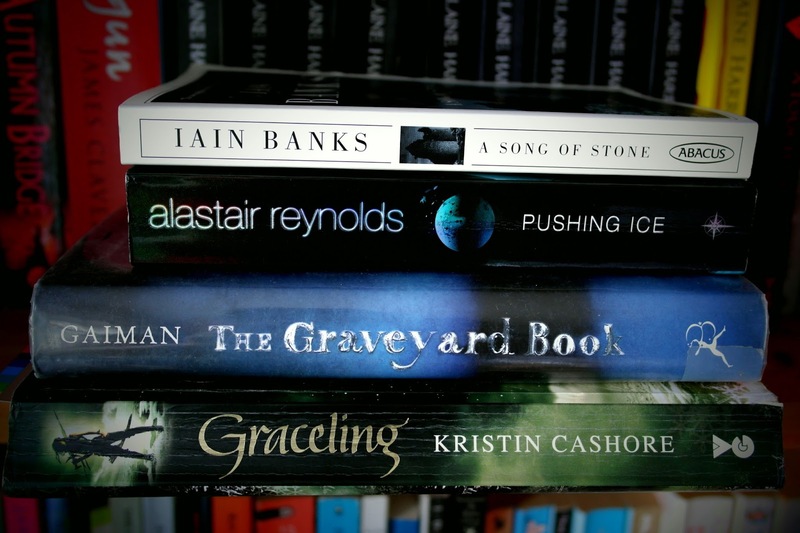 A Song of Stone by Iain Banks – set in an unnamed European country, this one sounds pretty interesting. It is about a lord and lady who are trapped in their own castle by a band of outlaws and has some rather mixed reviews on Goodreads. It sounds quite dark, and I’m interested to see what I’ll think of it, as I didn’t particularly enjoy The Wasp Factory. A 50p charity shop find. Pushing Ice by Alastair Reynolds – more science fiction! I may end up reading and reviewing this one for Sci-Fi Month, but I will definitely be reviewing at least one other of Reynolds’ works. I absolutely loved House of Suns, and hope this one lives up to that. The Graveyard Book by Neil Gaiman – because I need to read more Gaiman. I think all that I have read so far is Coraline (but I have my sights set on American Gods). 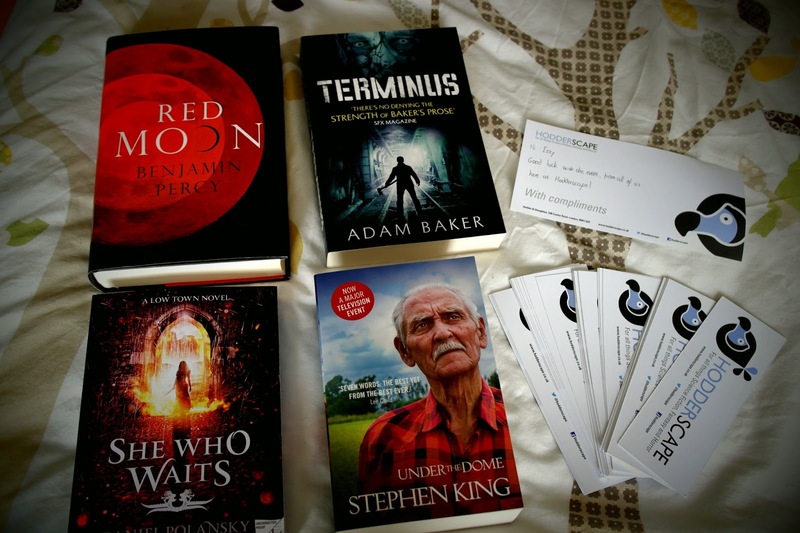 A signed copy of Red Moon by Benjamin Percy, Terminus by Adam Baker, an uncorrected proof copy of She Who Waits by Daniel Polansky (which isn’t even on Goodreads yet!) 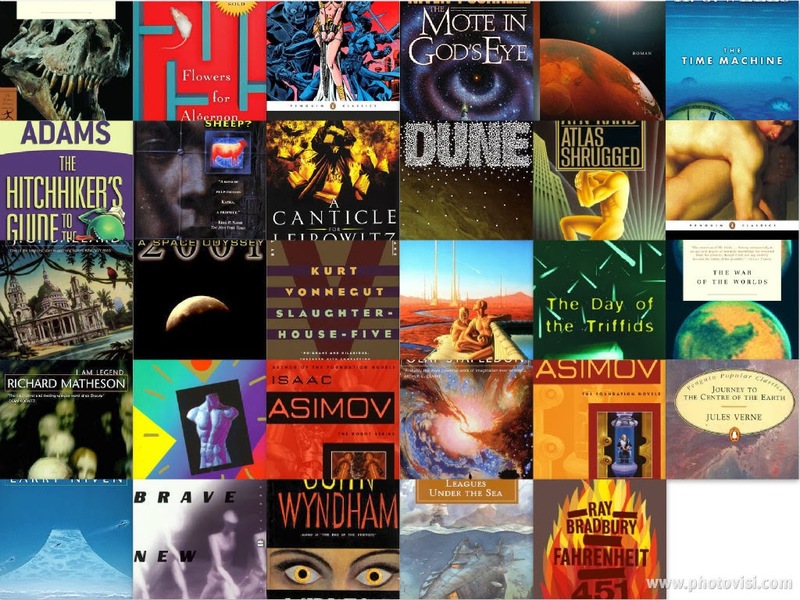 and Under the Dome by Stephen King, as well as lots of bookmarks! You’ll have to wait until November for details on how to win these, but until then you can learn more about Sci-fi Month here. So instead of my usual features, I thought I’d post about the Cheltenham Literature Festival for the next two weeks, as I’m working there, and a round up post at the end would be far too long! If you want to know more about the festival, click the logo above to visit the website. 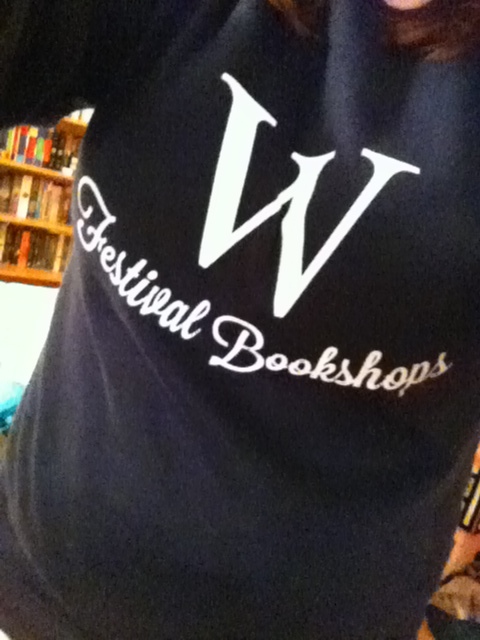 I was so excited when I found out I’d gotten a job working at the festival – and right in the Waterstones tent where all the action happens! 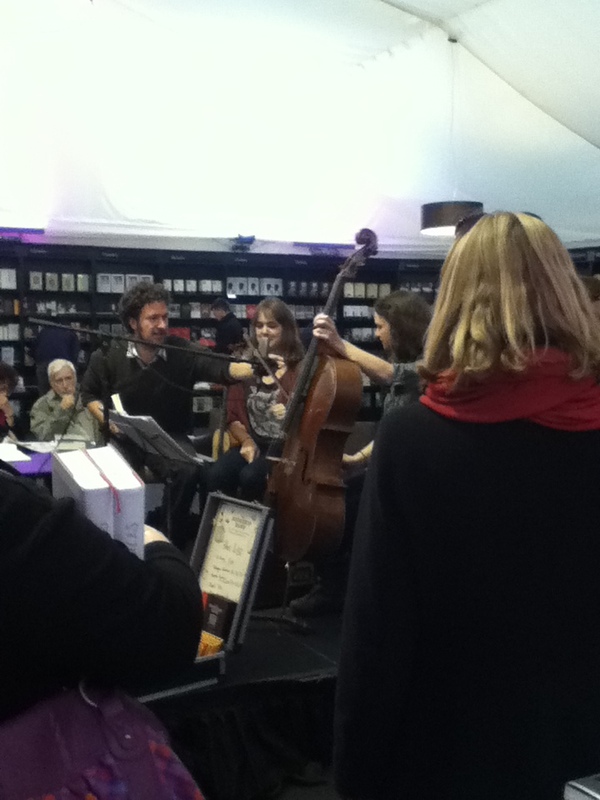 I’m working as a bookseller, which is self-explanatory, but we also help out with queue management and chat to people queuing for events, keep the tent looking tidy, set up for events and signings, etc. I’ve already seen some interesting people! We started setting up on Monday, but yesterday was the first official day of the festival. There are events spread out in various venues, and the tent I’m in is often used for book signings, meaning I get the chance to see some exciting people! Events didn’t start until 12pm, and combined with the fact that it was a weekday, it was a little calmer. The tent is heaving just before and after events – you can always tell when someone big is talking, because it’s like a ghost town for a while and then absolutely packed! The first person I saw yesterday was Will Gompertz, the BBC Arts Editor and former Tate Gallery director, who has recently written a volume on the history of modern art. He was doing a signing but we had a slight problem – a large amount of the stock was faulty, the second lot of photo inserts being upside down and back to front! Luckily this was soon sorted out by the editor, who offered to send a free second (and correct) copy to anyone who bought the faulty one, and Will signed bookplates for those who got faulty copies to place in the corrected ones. It was a bit of a scare, with it being the first event but I was really impressed with how easily it was handled and actually how the customers didn’t even seem to mind too much – a lot of them saw it as a bit of a novelty, actually. 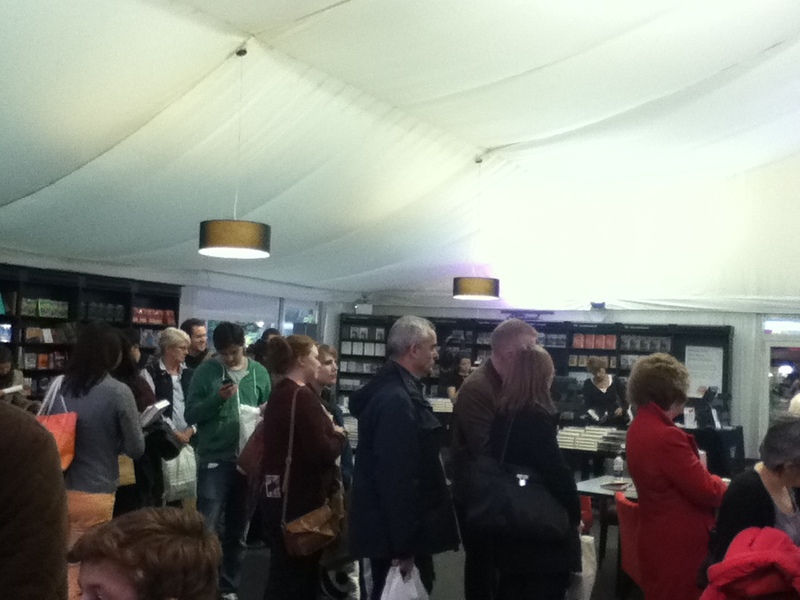 Later in the afternoon, Sebastian Faulks was giving a talk as well as signing copies of his new book, A Possible Life. I managed to see him, but didn’t get to snap a photo! Paul Auster was also signing at the same time. Other guests at the festival that day that I didn’t get the opportunity to see included Salman Rushdie, Tom Holland, Pat Barker, Anthony Horowitz, Kofi Annan, Jon Ronson and Peter Serafinowicz. Today, being a Saturday, was much busier. 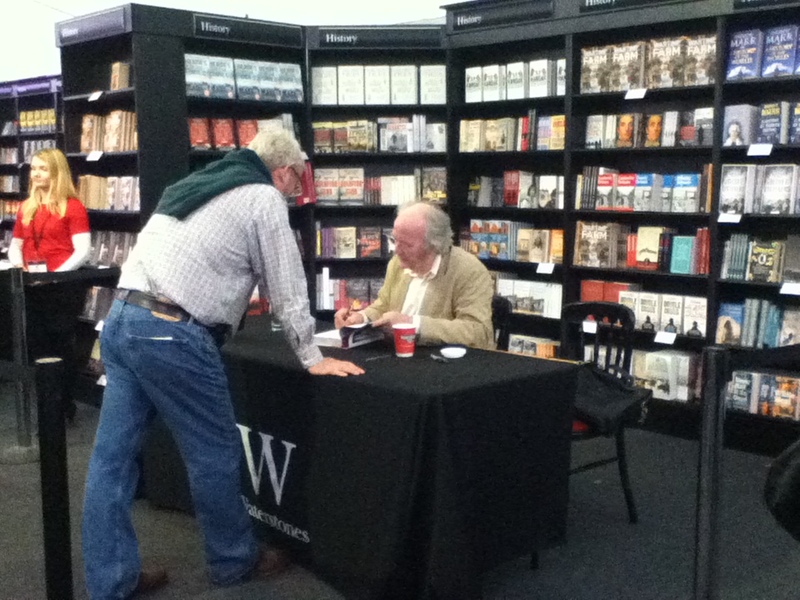 Michael Frayn did a signing in the morning, though I actually didn’t get a chance to catch a glimpse of him – I remember all my friends doing A Level English (which I regret not doing) having to read Spies. Later in the afternoon, Sean Borodale, Ann Gray and Adam Horovitz were all signing, after doing a panel together. I was at the tills with a colleague, who normally works in a Waterstones elsewhere, and this woman came over asking if we had Jack Straw‘s books out. We both assumed that she was asking where they were because she wanted one signed, and then Jack Straw practically materialised next to her – she was actually his publicist! There were (and still are, the day isn’t over yet!) so many exciting people at the festival today that I didn’t get a chance to see: Alexander McCall Smith, J.K. Rowling, Michael Palin, Roger Moore, Benedict Cumberbatch, Iain Banks, Jung Chang and more. Mary Beard is there tomorrow, and I love her but I’m going to miss her event so I’ve reserved a book for her to sign for me, which I can pick up. Exciting! My next post will be on Tuesday evening, covering tomorrow and Tuesday (as Monday is my day off).